In a two-hour interview, the broadcast legend reflects on his "marvelous journey." Did you know that Arizona has a Socrates on the team? Yes, Socrates Brito. He’s an outfielder for the Arizona Diamondbacks. Can you imagine? Socrates, who drank the hemlock, is playing baseball. It’s Vin Scully, the voice from the heavens, already gathering his material for the Los Angeles Dodgers’ home opener Tuesday against the Diamondbacks. Really, he’s preparing us for the last opening game of his exquisite, eloquent and extraordinary career. 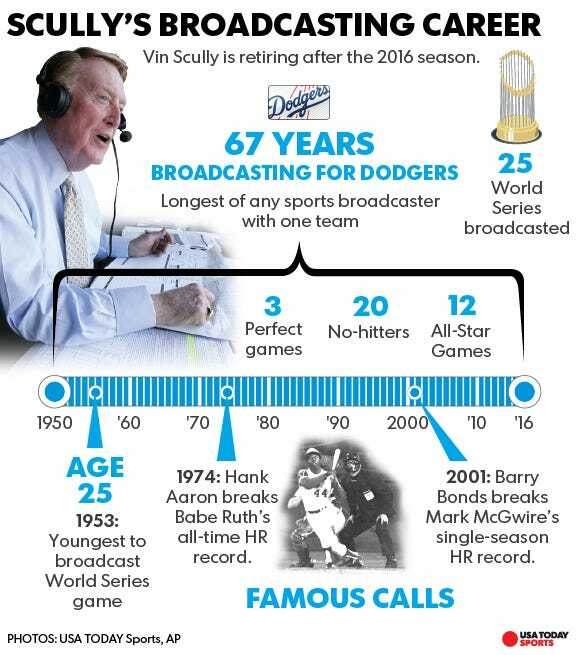 This is Scully’s 67th and final season as the voice of the Dodgers, and never again will baseball sound the same. Once Scully signs off after his final game, Oct. 2 against the Giants at AT&T Park in San Francisco, one of sports' greatest legends will finally recede into silence. There’s one difference between Scully closing his scorebook a final time and Babe Ruth in his last at-bat or Muhammad Ali in the ring for one more round. Scully, even at 88 with 16 grandchildren and two great-grandchildren, is still in his prime, still the greatest of all time. "His calls are so embedded in our brains, they will live forever," said Dodgers broadcaster Charley Steiner, entering his 48th year in broadcasting. "We are all reporters in the booth running real fast. He’s a poet that glides. "He’s the best who’s ever done it and the best who will ever do it. He’s the poet laureate of baseball." Hi, everybody, and a very pleasant good afternoon to you, wherever you may be. "People ask me what my favorite call for Vin is, and that's it, his opening," said Dodgers broadcaster Rick Monday, who has been in the booth for 23 years after a 19-year playing career. "He owns the English language to begin with, and how he finds words, and presents the words to perfectly fit the occasion, is phenomenal. "You can talk all you want about the great Dodgers in history. Jackie Robinson. Sandy Koufax. Gil Hodges. There’s been no one greater than Vin Scully." Scully, a private and religious man of Catholic faith, is embarrassed by all of the accolades and tributes that started in earnest Monday when they renamed the road leading into the main entrance of Dodger Stadium as Vin Scully Avenue. A throng of fans showed up for the midday ceremony, reluctantly accepting Scully’s refusal that he go one more year beyond 2016. "It’s very humbling," Scully told USA TODAY Sports. "I was a street kid in New York. We didn’t have Little League. The only place to play after school was on the streets. We played stickball. We grabbed a broom handle and a tennis ball, the manhole covers were the bases, and we played every day until midnight. "I was a rabid Giants fan. The Polo Grounds was about 20 blocks from our grammar school. I would get out of school during the week at 2:30, walk a mile, get in free and watch the Giants play. My idol was Mel Ott. I would hit like him, raise my leg above the ground like him, everything. "So for a street kid from New York to have a street named after me, it’s so overwhelming." Scully, who rarely watches baseball broadcasts, preferring to fall asleep with a book by his bedside instead of TV, and hoping one day to visit Niagara Falls for the first time and maybe Lake Louise in Alberta, Canada, too, reflected on his career last week in an exclusive two-hour interview with USA TODAY Sports. As Scully takes stock of six very special decades, it’s the people and the moments away from the diamond that resonate. Scully said he’ll always be grateful to Red Barber for giving him his start out of Fordham. He’ll cherish an impromptu Christmas Eve invite for drinks at the home of President Reagan and Nancy Reagan, will remember a stranger by the name of John Wooden opening the gate to his apartment complex when he moved to Los Angeles, ice skating with Jackie Robinson, and playing golf with the first President Bush. Scully, who began broadcasting Brooklyn Dodgers games in 1950, has seen it all. He was the youngest person to ever broadcast a World Series game in 1953 and was behind the microphone for the Dodgers’ first title in 1955. He called Don Larsen’s perfect game in the 1956 World Series. Three of Koufax’s no-hitters and perfect game. Twenty no-hitters. Hank Aaron’s historic 715th home run. 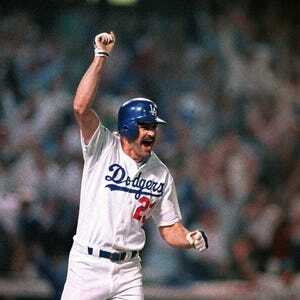 And Kirk Gibson’s dramatic homer in the 1988 World Series. Perhaps nothing was more poignant than his call the night of April 8, 1974. "When Henry hit it, I described it: 'It’s a high drive into deep left-center field. Buckner goes back to the fence. ... It is gone.' Then I just shut up. For a long time. "I always let the crowd roar. It was like when I was 8 years old and we had this big, four-legged radio in the living room, and the only sports on Saturday was a college football game. I would crawl under the radio, put my head under the speaker with saltines and a glass of milk. And when someone scored, the crowd would go crazy, and that crowd noise would come down and wash over me like water out of a shower head. "To me, it is absolutely a symphony. I was completely enamored by the crowd noise. "So I waited, and it gave me time to think, and then I said, 'What a marvelous moment for baseball. What a marvelous moment for Atlanta and the state of Georgia. What a marvelous moment for the country and the world. 'A black man is getting a standing ovation in the Deep South for breaking a record of an all-time baseball idol.' "
"It was the most IMPORTANT homer, and you can put that in capital letters, that I ever saw," Scully said. "It was more than just a home run. More than a game-winning home run. What it did was provide a lift to the whole country." While Aaron’s home run was the most historic of Scully’s career, the most famous in Dodgers history belonged to Gibson. He was hobbled before Game 1 of the World Series and wasn’t even on the bench during the game. During a commercial break, Scully — working the national TV broadcast for NBC — asked the producer to show the Dodgers dugout when they returned. "As the camera panned the whole thing," Scully said, "I said, 'He’s not there. Obviously, he’s not going to play tonight. Gibby is sitting in trainer's room with bags of ice on his leg.' "
"High fly ball into right field, she is gone," Scully said, the final word coming with an incredulous emphasis rare for the veteran broadcaster. "In a year that has been so improbable," Scully said a minute later, "the impossible has happened." Scully, 28 years later, still calls it the most theatrical home run he’s ever called. "In all of my years with the Dodgers," Scully said, "that was my greatest contribution, getting Gibson off the trainer’s table." Scully laughs. He hasn’t sat down and figured out his all-time team, but easily calls Willie Mays the greatest player he’s ever seen and quickly determines his outfield: "Mays, Aaron and (Roberto) Clemente. Anybody want to argue? Oh, and I’ll put Stan Musial at first base." Certainly, of all of the tens of thousands of players Scully has covered with the Dodgers, no one has come close to the historical significance of Robinson, who broke the color barrier in 1947. Scully was aware of the enormous stress Robinson endured during his career and vividly remembers a whiskey bottle being thrown from the upper deck in St. Louis, nearly hitting Robinson and first baseman Hodges. "You were always aware there was more going on than just a baseball game," Scully said. His most favorite memory of Robinson has nothing to do with him on the ballfield, but in New York’s Catskill Mountains. They found themselves at Grossinger’s Resort in the dead of winter, 1951. Scully had brought his ice skates. Robinson: "I’ve never been on skates in my life." Scully: "Jack, I’m not a great skater, but there’s no way you can beat me racing." Robinson: "That’s the way I learn." "His competitive spirit was such (that) just by competing he would learn how to skate," Scully said. "Well, he fell down immediately, and when he got up, he was walking on his ankles. It was hysterical. "I still have a picture of Jackie and me lined up like we were at the Olympics and the gun was going off." Scully has kept little memorabilia over the years, saying if he were a serious collector he would need two houses. His favorite piece may be the 1955 Brooklyn Dodgers World Series ring. Dodgers owner Peter O’Malley, who Scully calls "as nice a man who’s ever been put on this Earth," had it produced from the original mold when he discovered nearly 35 years later that Scully never received the ’55 ring. It was only given to the players at the time. Now, Scully has rings from all four of the Dodgers’ World Series championships. "That was the most amazing day when the Dodgers won it in ‘55," Scully said. "I went to the Lexington Hotel, picked up my date, and we go through the tunnel into the borough of Brooklyn. It was like V-J Day. Thousands of people were dancing in the streets. It was unbelievable. "My date, the poor girl, was just shocked. I guess she got over it. She went on to invent Sesame Street. Joan Ganz." His favorite pictures in the house are the ones with him and his wife, Sandi, and the six kids they raised. Vin and Sandi still hold hands when they go out to dinner together, close friends Dennis and Cyndi Gilbert say, calling the couple "America’s greatest love story." "He lives his life to please his wife," Dennis Gilbert said. Vin and Sandi would travel together over the years, but this season Scully will do only home games. Yes, games that most of Los Angeles won’t see because of Time Warner Cable’s dispute with other TV providers, now going on three years. Scully, wanting to make sure Sandi could at least watch his final season, ordered an additional TV provider for their home, but he's stayed out of the nasty dispute. He cringes when his name is used as reasoning for the games to be shown on other TV providers. "Gee whiz, come on, that embarrasses me," Scully said. "I don’t belong in that. That’s a discussion between powerhouses, not me." Besides, Scully says, he’s got enough to take care of in this new era of technology. He still prefers newspaper clips and computer printouts for his broadcast research. He has no Twitter account, Facebook, Snapchat or any other social media. Want proof? How about the uproar Scully caused when he informed the audience that outfielder Shane Victorino had broken the news on his Twitter account that he was being traded from the Philadelphia Phillies to the Dodgers. "I was saying on the air," Scully said, "Victorino used the Twitter and he sent a twit to tell the fans he was coming. Well, the city went hysterical. The sky nearly fell down from laughter. "I always thought that if you are going to use Twitter, it’s going to be a twit. Why would it be a tweet?" Oh, and the fans still love the kid in Scully when he broadcasts Dodgers games against the Los Angeles Angels. Whenever first baseman Albert Pujols comes to bat, Scully can’t help but call him Prince Albert. "We thought that was hilarious. As dumb as it is, every time I say Albert, I think of Prince Albert when I was 11 years old. It brings the 11-year-old out of me." Scully’s voice brings the youth out of all of us, and although Scully was taught by Barber to be careful getting close to the players he covers for fear it would cloud his judgment, every player in baseball is his friend. If you don’t know Scully personally, you certainly know the voice. The umpiring crew even points up to Scully’s broadcast booth before every game when they gather at home plate, and Scully always stands up and salutes them right back. Chicago Cubs manager Joe Maddon, in full uniform, even came up to Scully’s booth before a game last August simply to introduce himself. "I had never met him before," Scully said, "and was blown away. He must have stayed with me for 20 minutes. He’s as nice a man as I read. I was brokenhearted to see what happened when their left fielder, (Kyle) Schwarber, got hurt. Just like when A.J. Pollock, who’s such a wonderful player for Arizona, got hurt sliding head-first into home plate in an exhibition game. "I thought, 'Oh my gosh, life can be so cruel.' "
Scully has had his own heartbreaks. His first wife, Joan, died in 1972 when she took an accidental overdose of medication for bronchitis and a severe cold. His eldest son Michael, 33, a supervising engineer, died in 1994 in a helicopter crash while inspecting oil pipelines. He lost one of his best friends last year when Billy DeLury, the Dodgers’ long-time traveling secretary who joined the team one year after Scully, died at 81. The four of them, Scully, DeLury, Monday and Steiner, would have dinner together in a private room before every game, talking about anything and everything in life, a time Scully said that he’ll use to catch up on the latest baseball news. "I don’t watch other teams on TV," Scully said, "and I watch the Dodger games sparingly. I like to refresh my mind at night, so I like to read. "For me, watching baseball at night, it would be like an insurance man reading actuary tables. I like to escape." So what will our escape become without Scully, his golden voice coming over the airwaves during those summer evenings, and the man who introduced baseball to Southern California when the Dodgers moved in 1958 from Brooklyn? Scully is six months away from saying farewell, and there will never be another like him — a broadcaster whose grace and excellence will forever be identified with one franchise, yet somehow transcended his market to become the voice of his sport. "It’s been a marvelous journey," Scully said. "Now I want to share everything that I can with Sandi. That’s one of the reasons I have no regrets leaving baseball. God willing, when the season ends, I would like to cherish each day that I’m left with. "There’s that old saying: Squeeze the juice out of life before life squeezes the juice out of you. "I will try to squeeze the remaining juice out of life."